The perfect add-on for your Adventurer, Trailblazer or any wooden swingset or fort. 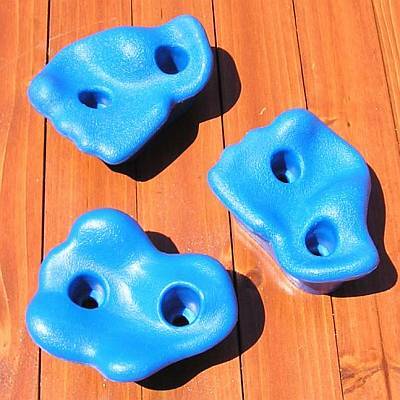 Our rock wall grips are custom made for children. Each piece features edges designed for solid slip resistant foot contact, that rim grips that are tucked and beveled inward enough to fit a child's fingers. 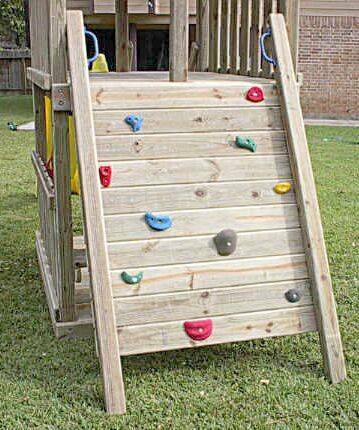 The instructions to build the wall (wood not included) should have a minor sloped incline, not too steep, but enough to challenge and excite your kids. Each of our swingset accessory pieces can be purchased as separate activity items or as complements to any wooden swingsets pr forts. Choose any number of our action paced components to help your kids develop strength and coordination, and at the same time, encouraging social interaction and cooperation. All of our accessories are constructed of the same durable, high quality materials as our swingsets and fort kits. All of the materials used in these accessory pieces have been selected for their strength and ability to withstand exposure to the weather outdoors and the heavy use they will experience when your kids discover play and climb on them. Extra bags of 5 rocks each with mounting hardware available.